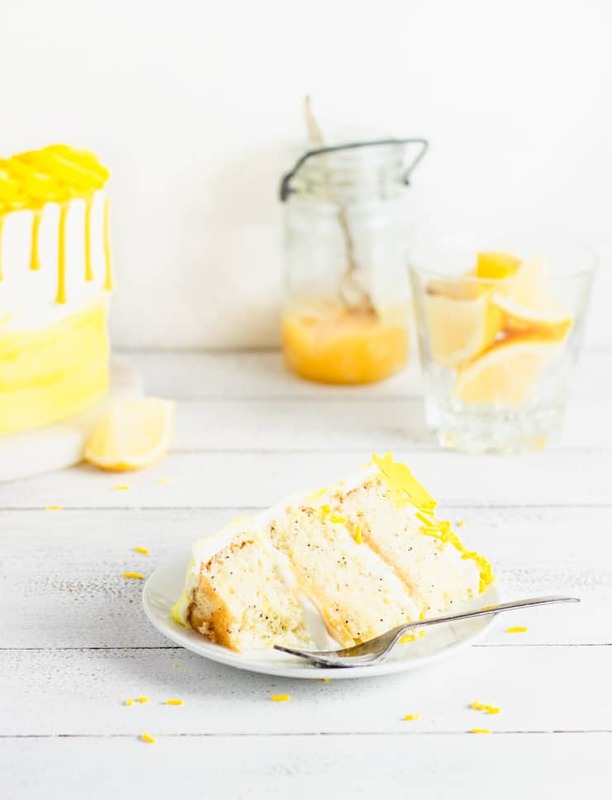 This lemon poppy seed cake strikes the perfect balance between tart and sweet! 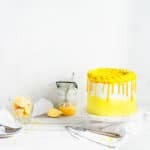 Made with homemade lemon curd, a moist poppy seed cake and a rich, creamy vanilla buttercream frosting, this delicious cake is sure to brighten your day! 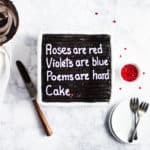 And so to make up for not being there to make cakes in person, I would often bake cakes in people’s honor, share the recipes on my blog, eat my feelings… You know, the usual things people do when they miss someone. So for my Mum’s birthday one year, I made this cake. It’s a combination of all of her favorite things: Lemon, poppy seeds and equal parts tart and sweet. I don’t know how she ended up with a daughter whose sweet tooth is as massive as mine because that’s just not her jam (or curd, in this case). But having made this cake almost 5 years ago, I thought it was time this bad boy got himself an update. Scroll all the way to the bottom if you want to see one of the cringy original photos. 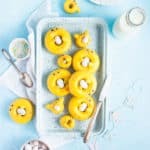 First, if you’re short on time and don’t want to make everything from scratch, you can cut a few corners by using store bought lemon curd and store bought frosting. For this recipe you’ll need about 2.5 lb of frosting and one 10 oz jar of lemon curd. If you’re not using store bought lemon curd, you’ll want to start by making that. To make the lemon curd, whisk together the sugar, lemon juice and zest, and egg yolks in a bowl over a pot of boiling water. Once the lemon curd has thickened, remove the bowl from the pot of boiling water and allow to cool for about 10 minutes. Cube the butter and whisk it into the slightly cooled curd mixture. Cover and allow to cool completely in the refrigerator before use. Second, make the cake. In a bowl, combine the milk and butter for the cake, and microwave using 20 second increments until you can stir the mixture smooth. In the bowl of a stand mixer, whip the eggs and sugar until light and fluffy. Add the dry ingredients and mix on low until just combined. Repeat with the remaining ingredients. Pour into three 6″ parchment paper-lined and greased cake pans. Bake at 350F for 22-25 minutes or until a toothpick inserted in the center comes out clean. Third, make the frosting. In a small saucepan, combine the water and granulated sugar for the frosting over high heat and bring to a boil, cooking until the sugar becomes clear. While the syrup cooks, whip your egg whites until stiff peaks form. Pour the sugar syrup into the egg whites (with the mixer on high) and whip until cooled to room temperature. Decrease the mixer to low, add the butter and vanilla extract, and continue beating on high until the frosting is thick and smooth. Finally, assemble and decorate the cake. Level your cakes (if necessary) and spread a layer of frosting between each. Use your offset spatula to carve out an indent in the frosting and fill with lemon curd. Coat the outside with a thin layer (crumb coat) and allow to set up in the refrigerator. Cover the cake with frosting, using an offset spatula or bench scraper to smooth the frosting and remove any excess. Tint the remaining frosting a shade or two of yellow. Dab on the yellow frosting on the lower half of the cake and use your offset spatula or bench scraper to smooth it. In the microwave, heat the candy melts and heavy whipping cream using 10 second increments until it stirs smooth. Pour the ganache into a piping bag and drip down the sides. Spoon the remaining frosting into a piping bag with a large star tip and pipe a crown of frosting around the top. Make the lemon curd in advance: If you’re looking to save some time, you can make the lemon curd a week and store it in the refrigerator. 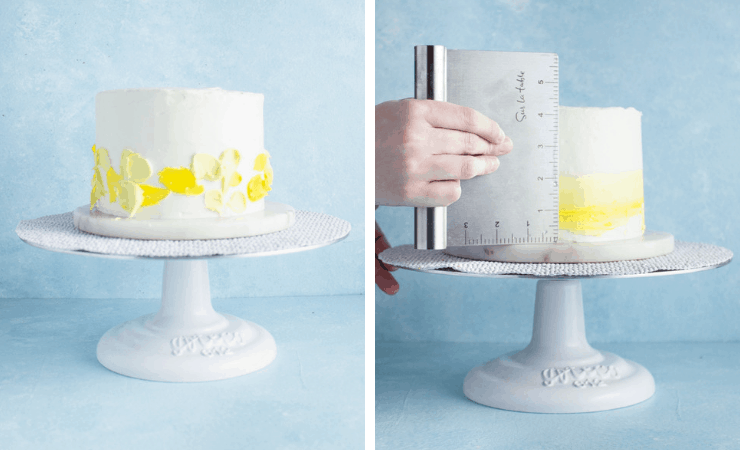 Measure your batter: Making even layers of cake start with measuring your batter. For this recipe, that means about roughly 9.3oz of batter per pan (for three pans). Chill your cake: Cool cake is easier to cut and handle, so chilling your cake for a short while before use will make this process easier. Saving time with store-bought frosting: If you don’t want to make your own frosting for this recipe, you can substitute about 2.5lb (or 2.5 containers) of store-bought frosting. Crumb coat: Spreading a thin layer of frosting around the sides and top of the cake, and then refrigerating it will lock in any crumbs and keep them from reaching the surface of your frosted cake. 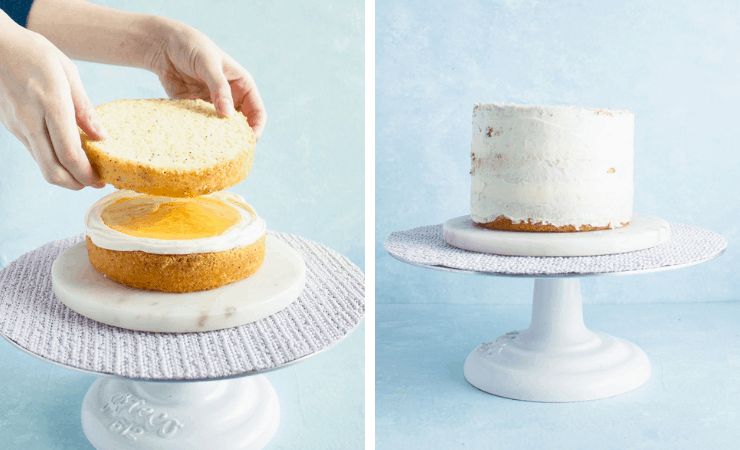 The trick for smooth frosting: You’ll need a rotating cake stand and a bench scraper. Place the small end of the bench scraper on the cake stand, long end against the frosting and turn the table. Once excess frosting is removed, heat the scraper in hot water, wipe and drag around the outside of the cake. Storage: This cake will keep at room temperature, uncut, for 3-4 days. For best results, cover it with a plastic lid, bowl or place it in a cardboard box. This is easiest if you don’t add the cookies until you’re ready to serve. Storing cut cake: Once your cake is cut, you’ll want to protect the exposed cake area. The easiest way to do this is with a piece of plastic wrap or two. For the lemon curd, whisk together the sugar, lemon juice and zest, and egg yolks in a bowl over a pot of boiling water. Cook the mixture until it thickens considerably, stirring occasionally (it should reach an almost pudding like consistency). Once the lemon curd has thickened, remove the bowl from the pot of boiling water and allow to cool for about 10 minutes. Cube the butter and whisk it into the slightly cooled curd mixture. Cover and allow to cool completely in the refrigerator before use. In a bowl, combine the milk and butter for the cake, and microwave using 20 second increments until you can stir the mixture smooth. In a small saucepan, combine the water and granulated sugar for the frosting over high heat and bring to a boil, cooking until the sugar becomes clear. While the syrup cooks, whip your egg whites until stiff peaks form. Tint the remaining frosting a shade or two of yellow. Dab on the yellow frosting on the lower half of the cake and use your offset spatula or bench scraper to smooth it. In the microwave, heat the candy melts and heavy whipping cream using 10 second increments until it stirs smooth. Pour the ganache into a piping bag and drip down the sides. Spoon the remaining frosting into a piping bag with a large star tip and pipe a crown of frosting around the top. Optional: Garnish with sprinkles. Update Notes: This post was originally published in March of 2015 but was republished with step-by-step photos and tips in February of 2019. Oh yay! You made it all the way to the bottom. High five! So you probably noticed that this is in updated version of an older recipe from my blog. And maybe that has you wondering what the cake originally looked (or maybe not… I’m no mind reader). Was it pretty? Did she even know how to use a decent camera?? That would be a no and no. And as much as I hate to share my cringy, old photos, I also appreciate the glimpse at growth it allows and the opportunity to remind you: Seriously guys, if I can do it, ANYONE can. Here’s a little glimpse at the original cake. This is stunning and you are right, I so want to try it!! All of my favorite flavors in one cake 🙂 (And colors too.) Thank you for the birthday wishes and have a wonderful trip to London! Is this cake moist? Do you think adding sour cream would make it moist? Lastly, if I attempt to make it for an 8 inch should I just double the recipe? How much sour cream would you add and would it be a substitute for the milk? Oh my goodness, Claire, this is gorgeous! 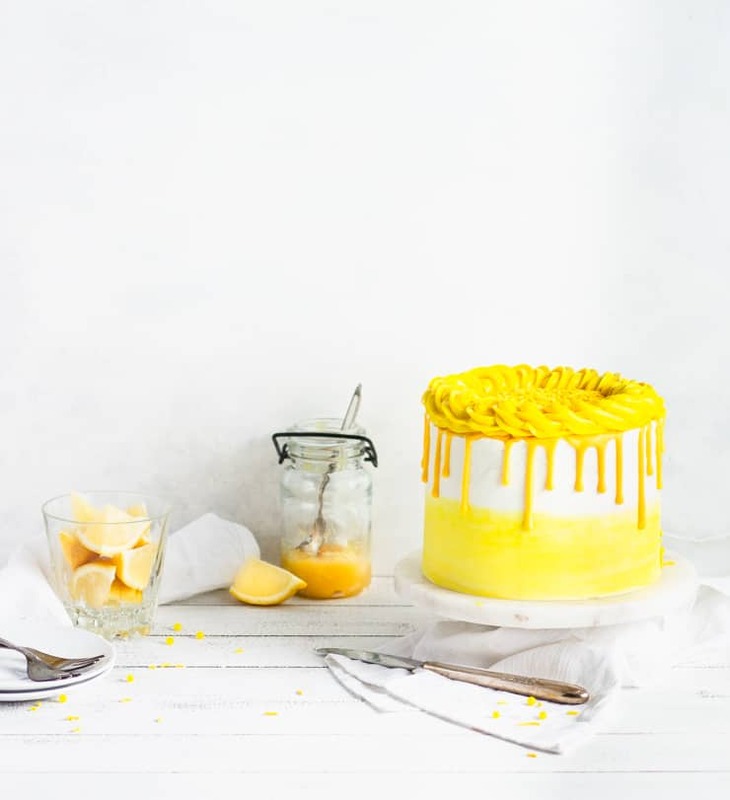 My husband is addicted to lemon desserts and I love a good decorating challenge. Can’t wait to try this. This cake sounds amazing! I’ve had lemon and poppyseed muffins loads of times – but never in a cake form. Love the idea for baking cakes for friends and family members’ birthdays – even if they’re not here to enjoy them! That gradient you have looks gorgeous! The flavor combo in this sounds just perfect. Since we’re not getting any sunshine here in Norway either, I thought I’d whip up a little in my kitchen. 😉 Wishing you sunnier days! 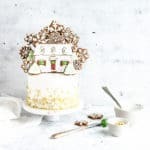 This cake is too gorgeous for words! I seriously appreciate the step-by-step frosting pictures, too. I haven’t attempted ombre frosting yet but with your tutorial, I just might! 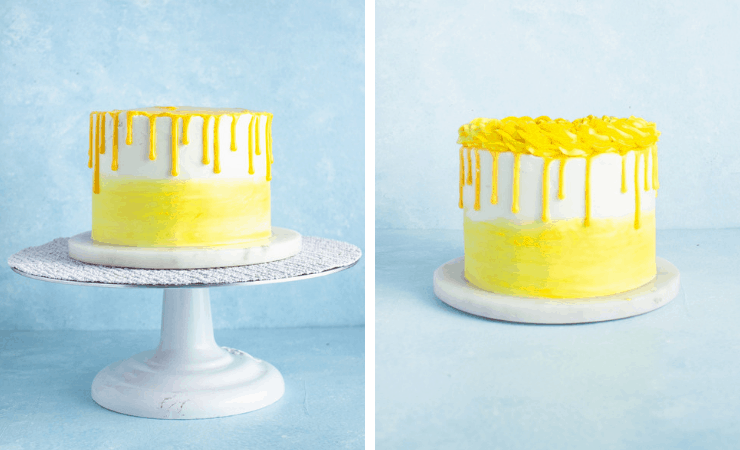 Ombre frosting is so much fun to do and a definite must try if you haven’t done it yet! 🙂 I find it easiest to pipe the frosting on because it helps keep it even and keeps you from mixing the colors as your applying them. I’m so glad you found this tutorial helpful and you’ll have to share some pictures if you try ombre frosting! This looks beautiful, and so delicious! This cake is gorgeous! I love lemon desserts and I wish I had this right now!! 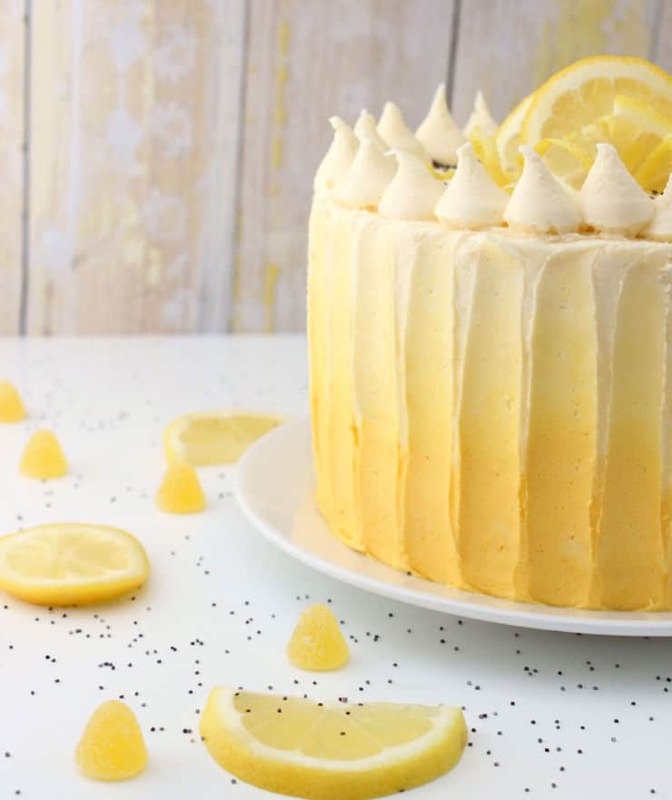 Lemon desserts are one of my favorites, and I LOVE the hombre look of the frosting! Thank you! 🙂 It’s definitely the time of year for sunny cakes! 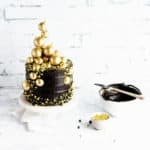 I love this cake and your tutorial photos make it look so easy to make! I’m pinning this so I can try my hand at it. Thanks for sharing! Completely gorgeous! Thanks for linking up with What’s Cookin’ Wednesday! 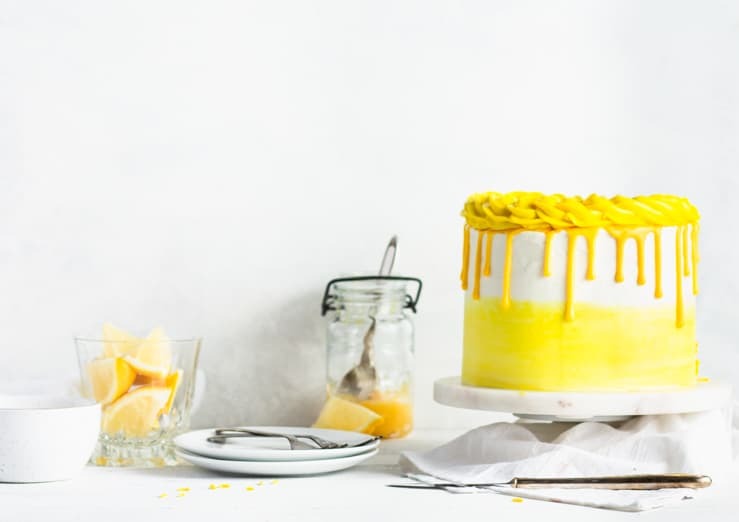 My interest was captured at lemon and then I saw there was lemon curd in this recipe….OH MAN. I can’t wait to try this! I figured if I was going lemony, I might as well go all the way. 😉 I hope you enjoy the recipe! Awww thank you for the sweet comment and feature! 😀 I’m so glad you liked the cake! This looks so fabulous, I want to eat the whole thing! Oh my! You are my favorite of the week… Thank you so much for linking up with us. Featuring you tomorrow during the party! I just got an order from my dear friend that he wants a lemon cake to celebrate his 50th birthday! I like my recipe but I am convinced that I should try your recipe this time! I love how you iced the cake! Just gorgeous and will be great for a guy’s birthday or a sweet baby shower! Thank you!!!! Blessings! Love this design! Just a quick question, would it work with cream cheese frosting since I know it can be harder to frost with. Thanks! I’m so glad you like the design! I think this would absolutely work with a cream cheese frosting as long as it’s a firm frosting and not too soft. Just made this cake today (slightly altered.) The curd was made yesterday exactly as instructed and came out delicious. We didn’t have 6″ pans, so we doubled the recipe and made three 9″ layers. The recipe didn’t call for salt, so we added a pinch of salt to cut down on the sweetness. We had some concerns when we got to the butter cream frosting for two reasons. The first being the amount of frosting the recipe would yield… although we doubled the cake recipe, we kept the measurements of the frosting the same as instructed and still had A LOT left over. The second concern was the overwhelming sweetness to the frosting. We cut that with about 5T of lemon juice, and it made a huge difference. The last bit of altering we did to this cake was toast unsweetened coconut flakes to decorate the tops and sides. Unsweetened coconut is so mild in flavor and looks so pretty once it is toasted. I have cake flour – would I just use that in place of the flour and baking powder? This is one of my all time favorites! And I love the re-do 🙂 Beautiful and sooo….. tasty! It’s cold and windy here again today, so this bright and cheery cake is just what I needed to look at! 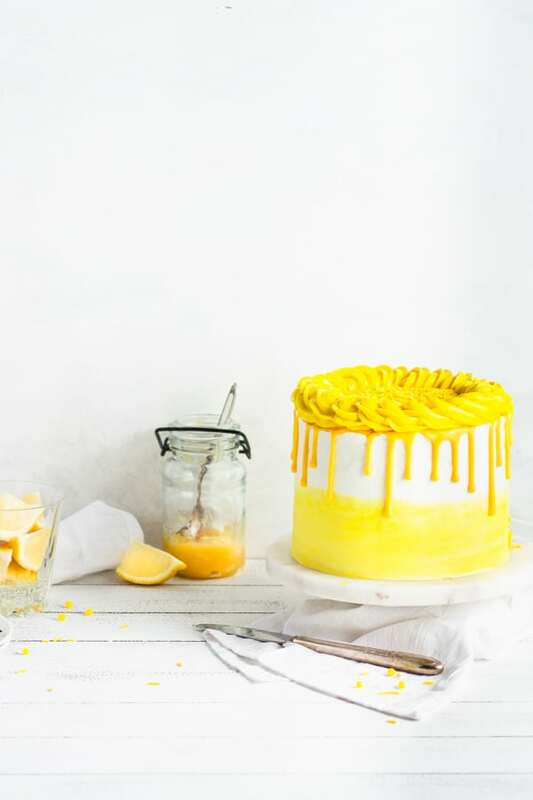 Love anything lemon, especially when it is decorated as lovely as this cake! And your older photo looks delicious too!